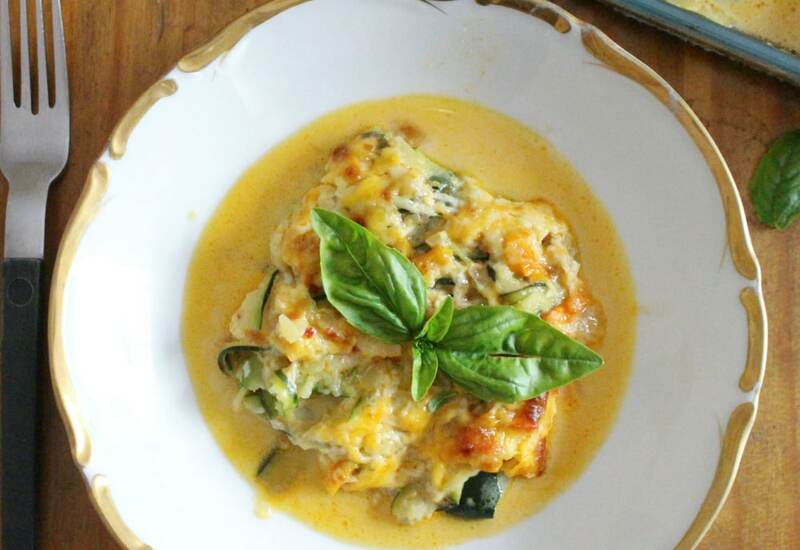 Cut down on carbs with this baked zucchini noodle dish in a delightfully creamy, savory sauce! Zoodles (zucchini noodles) are topped with a bell pepper sauce loaded with veggies and then baked with mozzarella cheese and Cheddar cheese, creating a lovely comfort food without the pasta! Make this a dairy-free meal by substituting coconut milk (the canned version) or almond milk and skip the cheeses at the end. Coconut milk will add a nice richness and a slight coconut flavor. Make this vegetarian by using vegetable broth instead of the chicken broth. Try this recipe with other spiralized vegetables instead of the zucchini. Yellow squash or sweet potatoes are nice colorful options. Per Serving: 587 calories; 47g fat; 26.4g carbohydrates; 18g protein; 143mg cholesterol; 1282mg sodium. I used roasted red peppers instead of the mini sweet bell peppers for a little kick. I really liked this recipe, especially how creamy the sauce turned out. I haven't made zoodles in so long, so this was a nice surprise.